Sheroes: Female Role Models in Sport is a NOWSPAR campaign to highlight women and girls in sport who are heroes but unrecognised. Our idea of a Shero is a female who lives an ordinary life while overcoming the barriers that limit participation in sport. There is negative stereotyping about the type of sport that women can be involved in, this limits the sport that women participate in. Most sport are further dominated my men and the culture that sport is a male activity, this results in drop out of girls as they develop into women. This is compounded by under representation of women and girls in the media, which reinforce stereotypes by coverage of traditional female sport participation and influences the availability of role models to inspire and motivate girls and women into sport and its various aspects. A baseline study on participation of women and girls in sport that gave both quantitative and qualitative information. Data gathered using questionnaires, interviews and focus group discussions. The sample included schools, civil society organizations, government departments, religious institutions and the general public. The research was done in Zambia in 2008- 2009 and covered attitudes, knowledge, awareness and practices relating to sport, physical activity and recreation. Media monitoring project: the study examined the coverage of women in sport by three national newspapers for a period of 2 weeks between October 2009 and 2 week in March 2010. The study looked at the quantity and quality of coverage. There is limited perception of women in sport as role models, in a baseline survey conducted in 2008 -2009, of the 540 people sampled, only 270 pointed out a female as a role model. This female is Esther Phiri, a professional global level boxing champion. All the others gave male role models in football, tennis, athletics and basketball. Coverage of women in sport by national newspapers is an average of 7%, with a drastic difference in quality and positioning of articles in the publication. Some reporters and editors are of the view that this is because women are not involved in sport, so can not be covered. 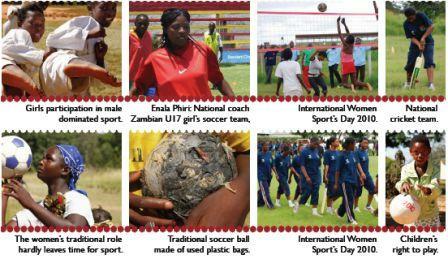 International Women’s Sports Day: We conduct a sports day annually to demonstrate the various sports available to women and girls and to promote interaction with a view of linking women to sport organizations and programmes. Sheroes Campaign is aimed at raising awareness, capacity development and support for women in sport. One of our activities is a profiling project, we are producing a TV documentary series to highlight the lives and experiences of women in sport in various sport codes. The women range from national coaches to referees and team coordinators. 2. Sponsor a Shero: Contribute towards the Sheroe’s sport activities including funding for TV airtime, sports equipment and any other support you may contribute. Sport is good opportunities for women to making bright future.